From lizards and birds to hot air balloons and 3-D houses. Looking for new art projects to add your first grade curriculum? Say goodbye to been-there-done-that coloring books. 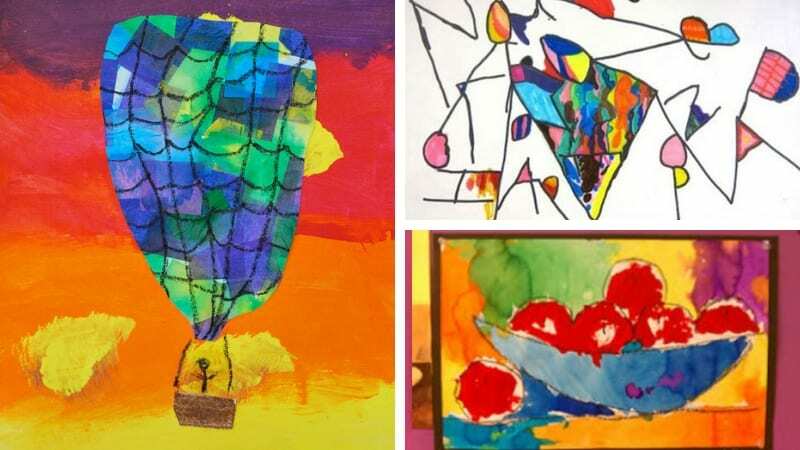 Below are some of our favorite 1st grade art projects that will challenge your students’ creativity. 1. This flock of birds will make any classroom more cheerful. What’s great about this project is that it breaks down how to draw a bird so that even the least artistically inclined student can nail it. Add the bird house and the tree, and you’ve got a whole flock of happy, cheerful birds. 2. Cezanne apples for first grade? I think so. Yes, these apples really were painted by first graders! To achieve this look, help your students trace the bowl and apples. Then, your students will outline everything with a black oil pastel. Pain the inside of the apples with tempera paint, but use watercolors for the background. You’ll be more than proud of your first graders when they finish these apples! 3. Reinforce the alphabet by making abstract art. It’s starts with an alphabet and ends with abstract art. This is a fun but simple project that easily fit into any rainy day afternoon. All you need is white paper and some markers. Students write the alphabet randomly—no straight lines! Then, using the markers, fill in areas created by overlapping letters. So simple yet so cool! 4. Sail away in this whimsical hot air balloon. Aren’t these dreamy? This project is a true multi-media project that utilizes paint (hello, sunset! ), tissue paper, crayons, and construction paper. There’s nothing I don’t love about this project. 5. Combine art and science for this not-so-obvious lizard project. Your student’s will get a kick out of “hiding” their lizard. Provide each student with a template of a lizard and a cardstock with a pattern. (Think: stripes, dots, etc). Simply, glue the blank lizard onto the cardstock and let your students get to work trying to camouflage their animals. Make it a contest: who can create the most successful camouflage? 6. These cuddly foxes are too cute to resist. First graders are just starting to move away from stick figures and into more advanced drawings. This step-by-step tutorial is perfect for first graders. Once the basic outline is drawn, your students can fill in the sections with crayons or pastels. 7. Create rainbows with this tried-and-true project. There’s a reason this project is so popular: it’s mesmerizing to watch those colors bleed together and create a rainbow of new colors and patterns. All you need is color filters, washable markers, a spray bottle of water, and newspaper or paper towels. 8. Fuse science and art with this bubbly art project. Warning: this is not a quick, do-it-all-in-one-afternoon project. You’ll want to break this down into a few days because this project has several components: making the “bubbles” with chalk on black paper, drawing the beakers (these are 3D shapes so you’ll need to provide step-by-step instructions), and the watercoloring the inside of the beakers. It will be worth the effort to see your first graders turn into mad scientists! 9. Follow in the steps of Kandinsky with these abstract compositions. Kandinsky is known for his circles, but he’s also known for his abstract designs. First graders can use their imagination to create their own abstract design. All you need is white paper, black markers, water color, and Q-tips to help achieve that muted color/haze. 10. Explore geometric art with this group project. Think big! Using a large canvas, divide the entire canvas into even squares. Each student will create his or her own square with tempera paint. Once the paint is dry, the students will draw circles over their painting using a metallic paint pen. The result? A stunning piece of art fit to adorn the school’s art showcase! 11. Teach the color wheel with this cut-and-paste treasure hunt. This art project is part treasure hunt and part art lesson. Using craft paper, cut and sort flower petals into warm colors and cool colors. Students must sort through the boxes to find the right colors to assemble their colors wheels. Tip: This is a good project if you have lots of scraps of different colored paper. What’s elementary school without a No. 2 pencil? What’s art class without papier-mâché? 13. Get crafty with these hand-woven wishbone sticks. This project is perfect for little hands who are just learning how to weave or sew. This project can be adapted for any age, but for first graders, use thick, chunky yarn and sticks with a wide “V”. The “in and out” pattern of the yarn will help improve dexterity and fine motor skills too! Safety first: Use plastic darning needles with no sharp tip. There are no major weaving skills required for these wacky baskets. Simply dip strips of yarn into glue and lay over an upside down paper cup. When the glue dries, remove the paper cup, and voila! You’ve got a wacky basket! 15. Create these 3D kiln-dried fish. This is a great project to work into your lesson plans when you read The Rainbow Fish. Tip: Always follow the instructions on your clay for proper air drying times versus kiln drying times. 16. Teach a first grader to paint like Van Gogh? Yep! You just need glue. Glue? Believe it or not, black glue is the secret to this art project. First graders are pretty adept at drawing flowers, and with just a few instructions, they’ll be painting Van Gogh sunflowers. To create this, draw the outline of the flower with black glue and let it dry thoroughly! Once the glue is dry, use vibrant watercolor paint to fill in each section. 17. Channel one of the greats with these birds that would make even Salvador Dalí pleased. Giant birds with super wiggly and silly legs? First graders will love the silliness of this project, but it’s not all just fun and games. 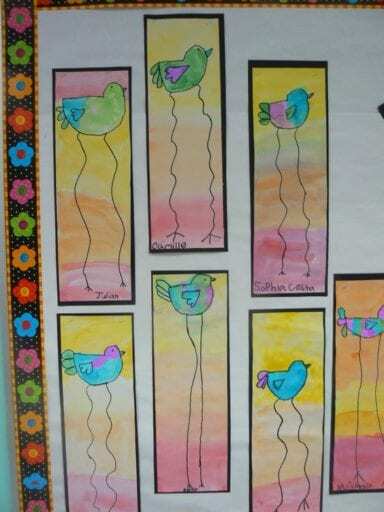 Your first graders will also learn the difference between cool and warm colors as the birdies are cool colors and the sunset is all warm colors. 18. Try Eric Carle-inspired collages. 19. Make fine art with some fine lines. This fun project gives first graders a few goals: exercising their imagination, practicing fine motor skills, and making some seriously goofy faces. 20. Build colorful 3D houses. All you need is construction paper, markers/crayons, a brown paper lunch bag, glue sticks, and a little imagination. What are your favorite 1st grade art projects? Come and share in our WeAreTeachers HELPLINE group on Facebook. Plus, our favorite kindergarten art projects.